Lauda Sion Salvatorem. 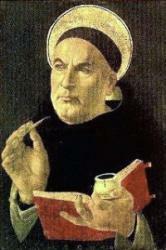 St. Thomas of Aquino. [Holy Communion.] This is one of the four Sequences which are alone retained in the revised Roman Missal, 1570, and later editions. It seems to have been written about 1260 for the Mass of the festival of Corpus Christi. For this festival St. Thomas, at the request of Pope Urban IV., drew up in 1263 the office in the Roman Breviary; and probably also that in the Roman Missal. In form this Sequence is an imitation of the "Laudes crucis attollamus " (q. v.), and con¬sists of 9 stanzas of 6 lines, followed by 2 of 8 and then 1 of 10 lines. Among early Missals it is found in a French missal of the end of the 13th century (Add. 23935 f. 11 &), and a 14th century Sens (Add. 30058 f. 83 6) in the British Museum: in a Sarum, c. 1370 (Barlow 5, p. 256); a Hereford, c. 1370; a York, c. 1390, and a Roman of the end of the 13th cent. (Liturg. Misc. 354 f. 58 &), all now in the Bodleian: in the St. Andrew’s Missal (printed ed. 1864, p. 213) ; in the Magdeburg of 1480, and many other German Missals, &c. Its use was primarily for Corpus Christi; but in the Sarum use stanzas xi., xii. ("Ecce panis angelorum") might be used during the octave. In the York use the complete form was used on Corpus Christi, and during the octave it was divided into three parts said on succeeding days, viz. (1) stanzas i.-iv. ; (2) v.-viii. ("Quod in coena Christus gessit"), and (3) ix.-xii. ("Sumunt boni, sumunt mali "). It has often been used as a Processional; at the Benediction of the Blessed Sacrament (especially stanzas xi. xii. ), and other occasions. The printed text is also in Mone, No. 210; Wackernagel, i., No. 230; Daniel, ii. 97. and v. 73; Kehrein, No. 150; Bässler, No. 100; March's Latin Hymns, 1875, p. 165, &c. The text, with a full commentary, is given in Dr. J. Kayser's Beiträge zur Geschichte und Erklärung der älteslen Kirchenhymne, vol. ii., 1886, pp. 77-109. "Sub diversis speciebus, Signis tamen et non rebus Latent res exitniae: Caro cibus, sanguis potus, Manet tamen Christus totus Sub utraque specie." "Beneath two differing species (Signs only, not their substances) Lie mysteries deep and rare; His Flesh the meat, the drink his Blood, Yet Christ entire, our heavenly food. Beneath each kind is there." “Fracto demum sacramento Ne vacilles, sed memento, Tantuni esse sub fragmento, Quantum toto tegitur. Nulla rei fit scissura, Signi tantum fit fractura Qua nee status nee statura Signati minuitur." "Nor be thy faith confounded, though The Sacrament be broke; for know, The life which in the whole doth glow, In every part remains; The Spirit which those portions hide No force can cleave; we but divide The sign, the while the Signified Nor change nor loss sustains."